BUFFALO, N.Y. -- The University at Buffalo men's basketball team continued to move up in the national rankings on Monday as they are now ranked in both the Associated Press and USA Today Coaches Poll. The Bulls moved up three spots to 22nd in the AP poll, while checking in at 25th in the first USA Today Coaches Poll of the season. The Bulls will break from their nine-day hiatus on Wednesday night with a perfect 3-0 record as they most recently defeated Southern Illinois last Monday 62-53 on the road. UB is still undefeated despite having played just one home game, which was nearly two weeks ago, while going on the road and delivering road losses at West Virginia and to the Salukis. Through three games, the Bulls have four players averaging in double figures, including CJ Massinburg, who is leading the MAC in scoring at 20.3 points per game. 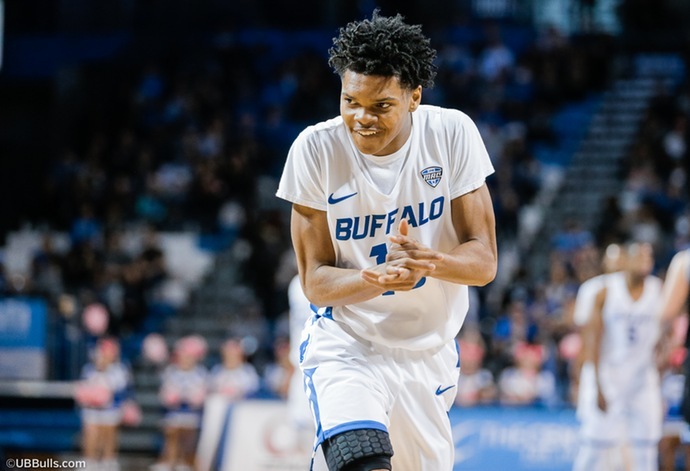 After a wild week of college basketball, there were a number of shakeups in both polls including both of UB's upcoming non-conference opponents, Syracuse and Marquette, dropping out of the rankings. Duke continues to lead both polls, including receiving all 53 first place votes in the USA Today Coaches Poll. Fans will have the chance to see Buffalo play their first ever games as a nationally-ranked program inside Alumni Arena beginning this Wednesday night when the Bulls welcome Dartmouth to town. Tip off is at 7pm.